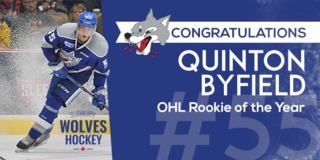 The Sudbury Wolves played their only Wednesday night home game of the season and finished with a perfect record beating the Soo Greyhounds by a 4-2 final. 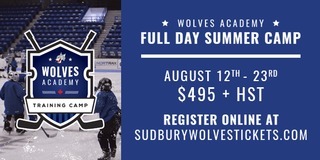 It was the defenseman who shone for the Wolves as Reagan O’Grady, Kyle Rhodes, and Cole Candella all scored for the home team along with David Levin picked up two assists and added an empty net goal. Jake McGrath played an exceptional game in net, making numerous key saves to keep the Wolves on top. The Greyhounds fired 33 shots at him as he back stopped his way to first star honours. 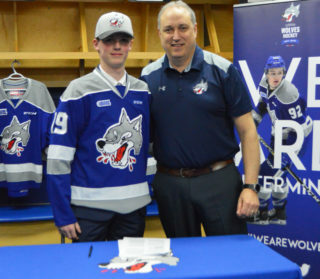 Another notable performance came from newcomer Doug Blaisdell who suited up in a Wolves jersey for the first time since he was acquired from the Kitchener Rangers on Tuesday. His play earned him the third star of the game. 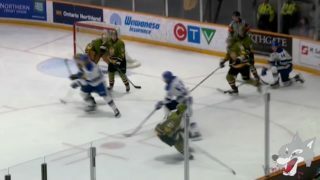 O’Grady opened the scoring as he wired the puck past Greyhounds goaltender, Matthew Villalta midway through the period. The goal came off of O’Grady’s first shot of the night and stood as the only one of the period as the Wolves took a 1-0 lead into the first intermission, trailing in shots on net 7-6. The Wolves continued to play off of their first period momentum, with Candella scoring 2:53 seconds into the second period. Candella’s goal came on the power play as his shot hit the crossbar and landed behind Villalta. Both O’Grady and Levin picked up assists on the play. Rhodes continued his offensive flair this season by scoring his fifth to put the Wolves up 3-0 at 8:07. The overage defenceman has had a tremendous start to the season and now has one more goal than his last three OHL seasons combined. Before the end of the period, Morgan Frost scored on the power play to put the Greyhounds on the board. Both teams battled back and forth in the third period, saving both goals for the last two minutes. With the extra attacker on the ice, Boris Katchouk beat McGrath with 1 minute and 33 seconds remaining in the third period to cut the Wolves lead to 3-2 but that was as close as they would get. With 13 seconds remaining in the game, Levin sealed the Greyhounds fate locking in a 4-2 victory. 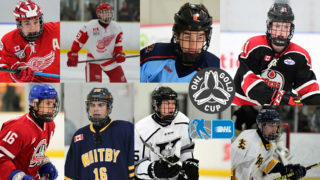 Final shots on goal were 33-25 in favour of the Greyhounds. 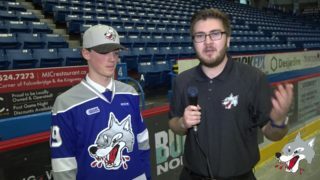 The Sudbury Wolves will continue their four-game home stand on Friday night at 7:05 when they take on the Sarnia Sting. Fans are encouraged to purchase their tickets in advance by visiting the Sudbury Arena Box Office, online, or by calling the Sudbury Arena Box Office.